Standing inside the same auditorium where his former coaches delivered passionate pregame speeches and reviewed game film with the team – Joe Philbin’s mantras and principles, as well as framed photos of the organization’s two Super Bowl-winning squads gracing the walls around him – former Miami Dolphins wide receiver Chris Chambers addressed dozens of fan-site moderators gathered for Web Weekend XI. Joined by fellow team icon A.J. Duhe and Finsiders host Greg Likens, Chambers – decked in a black windbreaker jacket and matching thick-rimmed glasses – was candid and reflective, touching on everything from being caught off-guard when he was traded to San Diego midway through the 2007 season to earning a Pro Bowl selection during Nick Saban’s lone tumultuous year in South Florida. After presenting DolfansNYC with two of our extremely humbling three Webby Awards and obliging every photo- and autograph-seeker following the ceremony, No. 84 graciously took time out to look back on his career highlights, express his appreciation for Dolphins fans on the road and much more in a one-on-one interview. Looking back on your six-and-a-half-year Dolphins tenure, what were some of your favorite memories? “There are so many moments. The Dallas Cowboys game (on Nov. 27, 2003), being able to score three touchdowns. Jay Fiedler and I both got the Turkey Award there, (but) I gave it to him though because he was the older guy. Now, I (tell him), ‘I want my award back!’ It was cool at the time. “My first touchdown against Indianapolis (on Nov. 11, 2001), Jay threw a beautiful ball to me, and I caught it, 60 yards (downfield). I ended up getting my second touchdown in the same game. “And then the Buffalo Bills game (on Dec. 4, 2005), where I set the Dolphins record for receiving yards and catches. 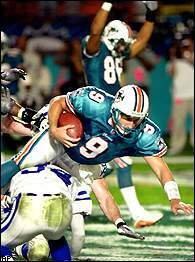 That was a game that was very bleak at halftime, and then enter Sage Rosenfels, and it was bombs away! That was an incredible Dolphins comeback against Buffalo. Do your franchise records still stand? You caught passes from 10 different quarterbacks in Miami. What kind of impact did the ‘quarterback carousel,’ as you’ve called it, have on your game? “You know, you kind of got used to it after a while. We never had that one guy who was the quarterback here – (whom) you started with here, continued to play with and grew with. That’s what made it difficult, when you’d have to have a different guy (frequently). I remember us having a left-handed guy, then we had another righty, and then a guy who was a little more mobile. Who were some players you admired growing up and modeled your own game after? “Growing up in Cleveland, Ohio, I was a huge Ohio State fan, so, Terry Glenn and Joey Galloway (were my role models). If you see a lot of my plays, you see me diving and stuff, I got that from Terry Glenn. When you first entered the NFL, were there any veterans who took you in and served as role models? “Absolutely – Sam Madison, Terrell Buckley, James McKnight, who was already a receiver here. He was one guy I really looked up to (because) he was a really good route runner, a very positive guy, a very clean guy. You recently had a chance to serve on the Dolphins coaching staff during training camp and help some of the younger players. How much did you enjoy that experience? Do you plan to pursue a full-time coaching gig in the future? 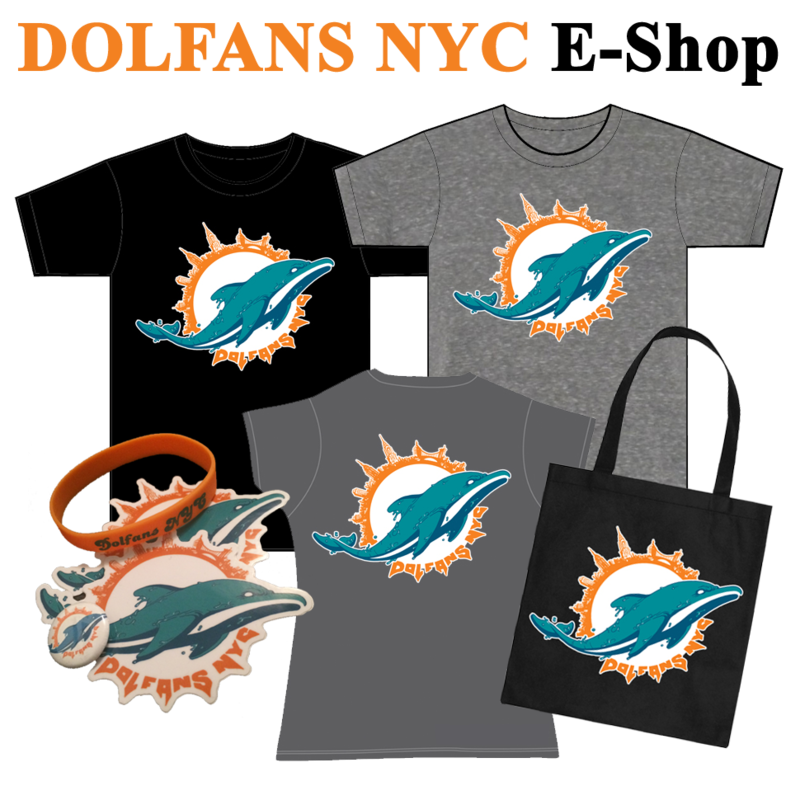 Finally, DolfansNYC will have as many as 1,000 fans cheering on the team when the Dolphins visit the Jets at MetLife Stadium on Dec. 1. As a player, how did it feel when you’d walk into opposing stadiums and see aqua and orange in the stands? “It felt so good! I think we have some of the best fans in the NFL – we always have. To come to New York – when you have your Fire Marshall on one side and have (Dolphins fans) rooting – it was just an outstanding feeling. Knowing you can come into a stadium and you see Dolphins tents and you see Dolphins tailgates, for the home team, it’s kind of intimidating, and it lets you know that the support is huge. 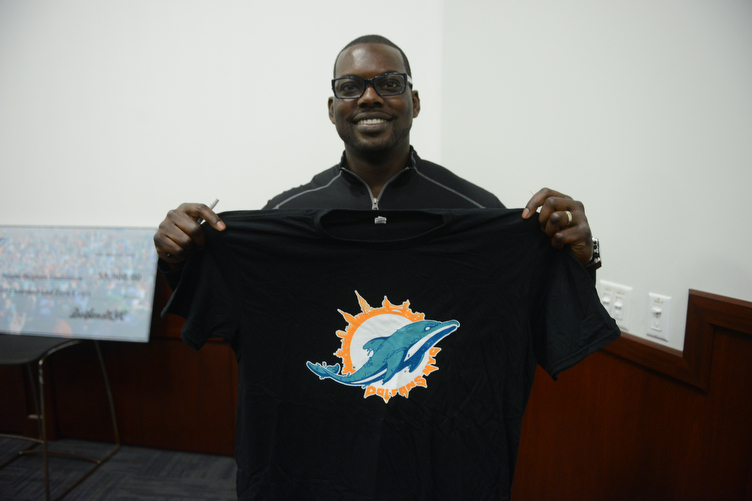 For more Chris Chambers check out his non-profit foundation Catch 84 and his South Florida training facility The Chamber.